Is this Christmas? Extracting The Legal Pain! Extracted is the legal pain. 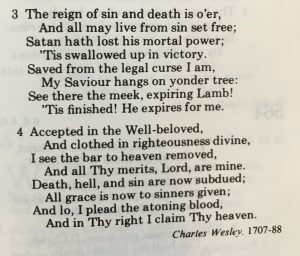 These five words in verse two form a single line in this remarkable hymn by Charles Wesley. This is Wesley at his best as someone said. These hymns are not inspired in the same authoritative sense that the Bible is but they can convey profound truth in a wonderful way. Inspired perhaps with a little i. These five words convey two very important Bible truths. Truths that need to be constantly stated because man in sin always assumes and seeks to state the opposite and to deny the truth. So what are these two truths? 1. ‘Extracted is the legal pain’ tells us of a problem. Any punishment is unpleasant and we all recognise that it’s the result of doing something wrong. Overstay in a car park and a demand for payment will arrive in the post. Get caught speeding and you’ll get a fine. These are trite examples but you get the idea. If you get caught breaking the law of God – and make no mistake we have all been caught – payment is required. The Bible calls it sin. And as we continue sinning, that is, as we continue breaking the law of God we are, as it were, earning a wage. The Bible says very plainly that the wages of sin is death (Rom 6:23). As if that wasn’t bad enough, the reason we continue to sin is because there’s a deeper problem. The problem is that there’s a something wrong with our nature. But we seek to deny it or play it down. What problem? There’s nothing wrong with me, you might say, even though you know full well there is a problem. There’s a deep-seated problem that’s impervious to mere outward reformation. What’s required is a reformation that goes far beyond any outward change. Changes of habit or lifestyle are definitely in vogue and even make good viewing. But these changes will do nothing for us legally before God. In the court of God who can make representation for us when on every hand we are found guilty in thought word and deed. Any earthly representative has the same problem. It’s no accident The Lord Jesus Christ is called our Advocate (1 John 2:1). The problem for us is that we need a nature that is beyond the law. There isn’t one! The law of God condemns all. It slays all! All are guilty and found wanting before a Holy and Righteous God. 2. Although the words speak of punishment in an excruciating manner the legal pain is being extracted from an innocent party. The fact is, the legal pain should really be extracted from me, the guilty sinner, but it’s been extracted from another! Secondly then, to ‘Extract the legal pain’ speaks of Substitutionary Atonement. And this is the heart of The Gospel and why The Lord Jesus Christ came into the world. And it’s why at Christmas we realise why The Christ came. It’s not really about stars, stables and shepherds but about a bloody cross, about agony of soul and of body, about punishment and death. It’s about the cost of Redemption! A cost we sinners cannot ever possibly pay. Not even an eternity will extract the legal pain from us! We need another to do it for us. One that is suitably qualified for the awful task. Although Wesley has captured the horror of breaking the law of God putting the frighteners on you is not necessarily a good evangelistic strategy. But on the other hand, you are a fool if you ignore it because you don’t like being threatened or dislike ‘hellfire preaching’. The truth is, there is a Hell. And there’s only one way to escape it (Heb 2:3). That way is The Lord Jesus Christ (John 14:6). Being ‘right with God’ is a legal declaration that God makes. This is the Justification by faith that is celebrated this 500th Reformation year – and every year. Because of what Christ has accomplished on the Cross, God is able to be just and to justify those that have faith in The Lord Jesus Christ (Rom 3:23-26). 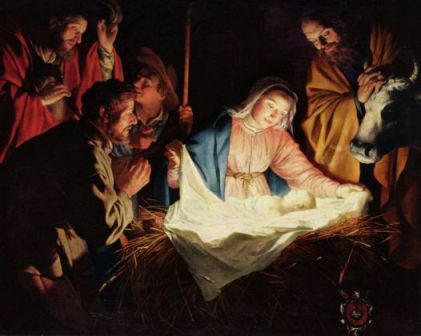 So it’s no wonder the Wise men and the Shepherds rejoiced when the Salvation of God appeared. We Christians ought to be amazed at what God did in sending His Son. And we are amazed at what Christ has done by coming to us when we could not and would not go to Him (Heb 10:5). Salvation truly is of The Lord. Will you trust Him? Is your faith in The Christ? Please have a happy Christmas. But don’t ignore or neglect what it’s really all about. 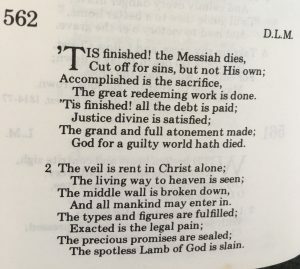 Posted on 21 December, 2017 21 December, 2017 by xercisedPosted in Gospel, Hymns, The BibleTagged Bible, Christmas, Gospel, Hymns, Jesus Christ, Saviour. Previous Previous post: From Glory to earth He came! 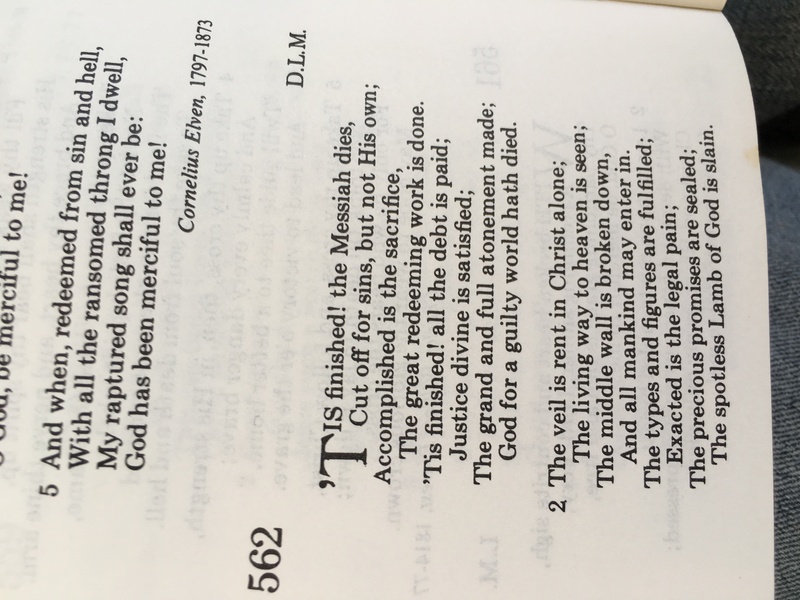 Wesley doesn’t say “extracted ” in the hymn , he says ” exacted” . Thanks for the exacting correction anonymous. Every ounce was definitely extracted though. Do you know if He did that for you? Exacted is better. And even better that He does it than we have to do it.